Roll-up, roll-up- get your fresh food here! 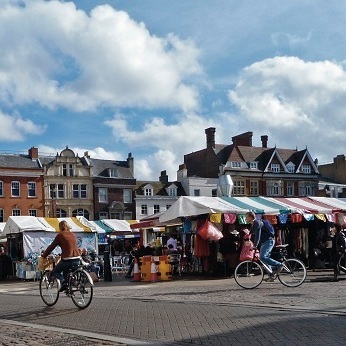 Stalls at Cambridge's general market sell a wide range of goods including fresh food, clothes, jewellery, second-hand bikes, plants, mobile phones and accessories, and much more. Although not all of the food stalls sell sustainable food, look out for clearly marked locally grown fruit, vegetables and other products. Fresh, locally grown produce and supporting small, local businesses.